During DockerCon 2015 in SF, Solomon Hykes asked the audience: “Who is using Docker and nothing else”? No one in the audience raised their hand. Our Developer and DevOps 2015 Survey reinforces this point and adds what developers are using together with Docker. In JFrog’s Developer and DevOps Trends survey for 2015 we gained some very interesting insights into how different companies build their software ecosystem. One of our goals was to determine the extent to which companies use a variety of different packaging formats, especially those using Docker. 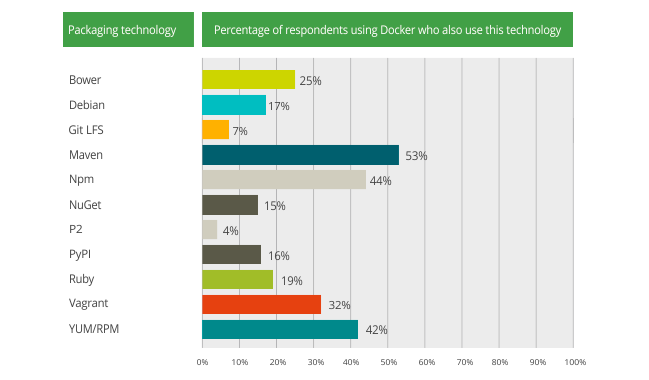 Before we go any further, it’s interesting to note that in spite of the huge amount of buzz around Docker these days, only one third of the survey respondents indicated that they were using Docker at all, whether in pre-production or production systems. An equally interesting statistic that stood out is that nearly all of the respondents who use Docker (98% of them to be more precise), also use additional packaging technologies. The diagram below shows how many. What else are developers and devops using? So we established that pretty much everyone using Docker is also using at least one additional packaging technology. Below is the distribution that shows which formats they are using. 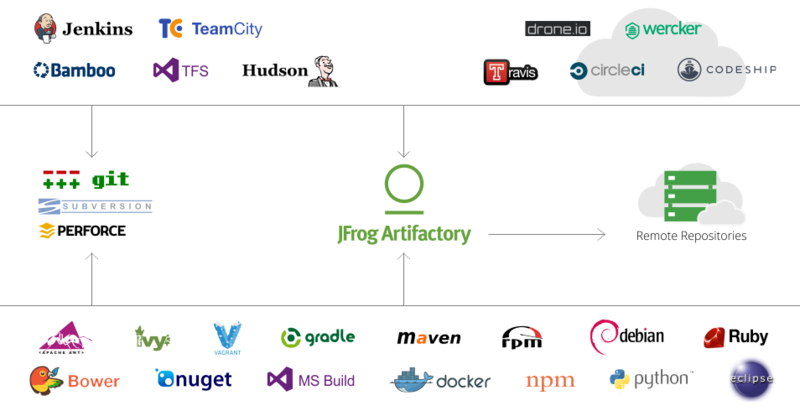 The results of this survey show what we, at JFrog, have known for years, and what has guided our vision of being at the core of any development ecosystem. Today’s software development industry has become so complex and varied that no single packaging technology can answer all the needs of a modern development ecosystem. While other products may claim that they also support additional packaging formats, you need to investigate what “support” really means. You will find that Artifactory is the only product that provides full content browsing, detailed, searchable metadata and comprehensive build information for all major packaging technologies in common use. As the only universal repository available today, Artifactory is the best choice for enterprises, both large and small. Not only does it integrate with all major build tools, CI servers and packaging formats, it is also the only repository offering High Availability, S3 object storage and multi-push replication. View our webinar recordings on Artifactory’s features to learn more.